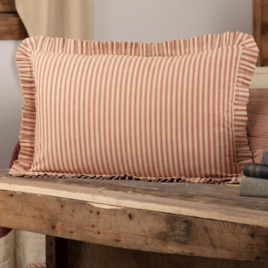 Rory School House Red Ticking Stripe Fabric Pillow 14" x 22"
Add a touch of charm to your country style with the Rory Schoolhouse Red Ticking Stripe Fabric Pillow. 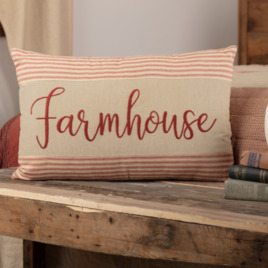 Ticking stripes on 100% cotton with ruffles along the edge for a rustic, farmhouse look. Reverses to red & tan ticking stripes with button closures. 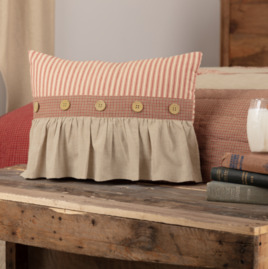 Every detail of the Rory Schoolhouse Red Ruffled Pillow says shabby chic with a touch of rustic romance. Brick red & khaki chambray ticking stripes with a strip of plaid & a khaki ruffle with buttons. Reverses to red and tan ticking stripes.